Sensors – Accelerometer,proximity, compass, light. Oppo is a Chines brand smartphone. Oppo mobile is best for their design and camera. This device launched in September 2017. 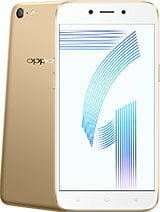 Oppo A71 comes with 5.2 inches IPS LCD touchscreen with 720 pixels by 1280 pixels. Under the hood this device powered by 1.5 GHz Octa Core Mediatek processor and it comes with 3 gigs of ram and 16 gigs internal memory that can be increased up to 256 GB via microSD card. This device runs latest Android 7.1 OS and is powered by 3000mAh non removable battery. Oppo A71 has 13 MP rear camera and a 5 MP front camera for selfies. This device is not available in Bangladesh and Oppo A71 Price in Bangladesh 16,990/- BDT.